For the rough outdoors, backpacking trips and camping, get the Intex Prestige Downy Twin Airbed Kit. It is so cheap you won’t think twice to throw it on the ground or grass. I think the most attractive thing about this twin sized air mattress is its price. Where can you get a decent upgrade from the bare ground for $20? Not even the Coleman is as cheap as this, considering that the Coleman is slightly more comfortable. But if you go camping like once in a blue moon and you are just looking for a sleeping option at the cheapest price possible, this is the best choice. The 20-gauge flocked waterproof top is strong enough to take the weight of a big adult man and keep away the cold and moisture. But that also means that the air mattress is heavier when it is deflated and rolled up. The included pump works well, but drains batteries pretty quick. If you are out in the middle of nowhere with this air mattress and pump, you’d better keep some spare batteries with you, or a spare pump. The valve needs a bit of understanding, but once you’ve got it, everything is easy. The one thing that I think defeats its purpose as a portable air mattress is that it doesn’t include a bag! But for such a price, I guess nobody can complain much. You can always wrap it in the tent or pack it nicely in the luggage so that it doesn’t get ripped. Well? 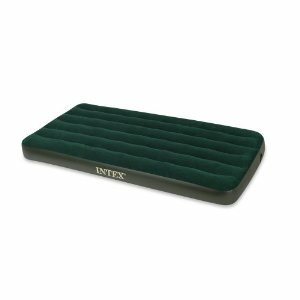 The Intex Prestige Downy Twin Airbed Kit is the best budget camping air mattress there is, you probably won’t find another at the same price and quality. Get it now at Amazon for $20, while it’s still in stock.